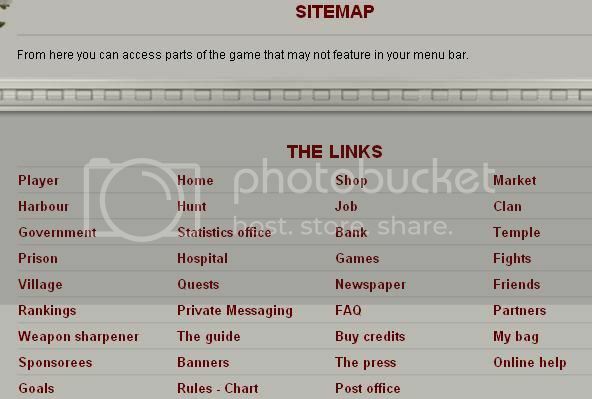 It is located at the top of the page ingame. Here you can find links to every area of Greek-Age. Alternatively, you can try using the light mode version under 'Profile' (at the top of the page ingame) - it will enable you to play the game with less flash application needed. How do I know which clan I belong to ? How do I know what location I am currently at? Go to your character page, you will see the icon of the clan you are located at currently. Alternatively, you can go to the harbour and look at the map. What are the respective city names assigned to each clan ? I'm confused ! Is it possible to change your character image - how? There is only one image available for the different genders and pacifist/warrior status, no other images available at this point.